There’s a reason why zombies have become so prevalent in film and television; a reason that is arguably even more grounded under the context of video games. The sheer joy of knocking down zombies with a variety of weapons excuses the unoriginal antagonists of this 4-player co-op arcade game. So what does this particular zombie title contribute to the already bursting market of decaying and blood-thirsty fiends? We dove in to duke it out with waves of incessant zombies to find out. This isn’t your typical zombie survival horror game. The second you step into the shoes of the protagonist - an avid gamer by the name of Jack - you’ll recognize just how seriously (or not seriously) he takes the recent infestation. Jack, in fact, is convinced that he’s somehow been implanted into a video game, and everything that ensues reflects his humorously casual perspective on the zombie apocalypse. Although Jack is the first character you’re introduced to, you’ll run into three other characters as oddly humorous as himself: Rachel the ex-girlfriend, Brian the mad scientist and Luxo the alien. Each character has a particular weapon class, like Jack’s apparent penchant for fire or Rachel’s “Ghetto” class that lays her claim to the Uzi. But the storyline takes a back seat to what is ultimately at hand with this game: and that’s hundreds of zombies and big, fat, mutated zombies, too. 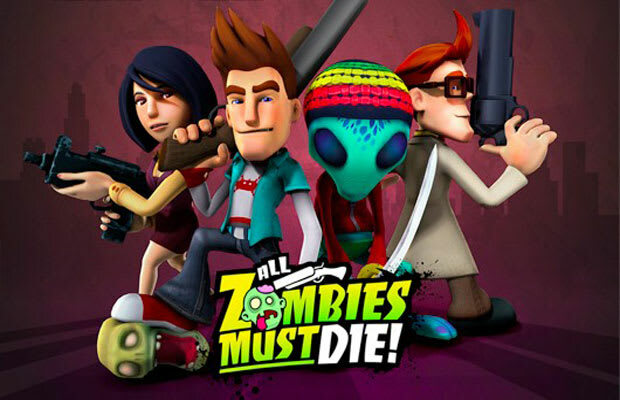 You can’t play a zombie game without your myriad of weapons, though, and All Zombies Must Die! has quite a few. If you’ve ever played the Dead Rising series, you’ll find the ability to combine weapons to make even more deadly ones instantly recognizable. Why would you ever NOT add flames to your weapon? Dragon’s Breath Shotgun? Yes please. David estimates about forty eight possible options once you’ve unlocked the ability to craft these totally illogical, but completely satisfying devices. As you navigate the fairly linear confines of the city streets of the aptly named Deadhill, the undead threaten to back you into a corner if you don’t fight your battles effectively with your teammates. The Ray Gun is awesomely powerful and all, but it won’t do much good up against your seriously hungry foes once they’ve ganged up on you. Although we’re much more personal fans of zombie games that let you roll around or sprint and button mash to melee your way through hordes of enemies, this twin-stick shooter throws down as a viable competitor. Not being able to quickly break out of a corner is cumbersome, though, and can impede both the pace and level of fun you have while hacking away at a crowd of zombies. So long as your teammates always have your back, you shouldn’t have much to worry about save for friendly fire (depending on what settings you have on, of course) from abusing your weapons in a state of panic during the inevitable onslaught of enemies. The game drips with the developers’ flare. Everything from the Shaun of the Dead inspired cricket bat to references to The Big Lebowski to the hidden “Developer Cards” strewn about the levels reflect the very personal touch put into this game. We stumbled on the Dutch Developer Card, which the lead artist had drawn up to liken Dutch, the technical artist on the game. Our glimpse into the practically comedic threat in All Zombies Must Die! was short lived, but full of a healthy variety of weapons and visceral ways of sending your undead enemies to their final resting place. We’re saving any determined opinions until we’ve seen the full force of brutality you can inflict on the enemies, though. We want to know more about the promised character-specific status effects (that either deafen, irradiate, shock or set fire to the zombies), the combo mechanic that grants you ten seconds of direly needed invincibility and, of course, an all-too-powerful bomb.